Avera Eason was the son of Elisha Eason and Edith Avera. Avera was born about 1805. Records indicate that Elisha Eason and Edith Avera had at least three children. Avera Eason married Polly (Unknown) about 1830. They had at least 11 children. The 1830 Johnston County, NC, Census shows only two people living in the Avera Eason home - one male "of 20 and under 30" years old and one female "of 20 and under 30" years old. This would have been Avera and his wife Polly. The 1840 Census shows the Avera Eason family living in Johnston County, NC. Avera's family had increased from 2 persons in 1830 to 9 persons in 1830. The males in the family were: Avera (age 30 and under 40), son Hardy W. (age under 5) and one additional male whose age was between 60 - 70 (this "could" have been Avera's father Elisha Eason). The females in the family were: Polly (age 30 and under 40), daughters Tempy B. and Lucinda (ages under 5), daughters Willa and Nancy (ages 5 and under 10) and one additional female (between the ages of 30 & 40 - no indications who this could be). There were two additional Eason families living nearby - but there is no indication how they were related. The Avera Eason family continued to grow from 1840 to 1850. Pages 73 & 74 of the 1850 Census shows the family still living in Johnston County, NC. Avera and Polly had 9 children: Tempy (age 20), Hardy (identified as "Harry", age 18), Milly (age 16), Nancy (age 10), Polly (age 9), Amanda (age 7), John Wesley (age 5), Caroline (age 3) and William (age 1). There is no indication why daughter Lucinda was not listed on the Census. Avera was working as a blacksmith. Page 119 of the 1860 Johnston County, NC, Census, shows Avera and Polly living in the Division East of the Neuse River. In addition to Avera and Polly, there were 10 children: Tempy (age 29), Hardy (age 28), Millie (age 23), Nancy (age 21), Polly (age 18), Lucinda (age 16), Amanda (age 15), John (age 13), Wm. (William, age 11) and Elisha (age 6). Caroline's absense from the Census suggests that she had died between 1850 and 1860). Avera's occupation is listed as "Mechanic", but since cars didn't come along until the 1900s, there's no indication of what type of mechanic he was. There is no Real Estate Value listed, but a Personal Estate Value of $600 is listed. Between 1860 and 1870, both Avera Eason had died. There is no indication where mother Polly Eason was living - perhaps living with one of her married children. 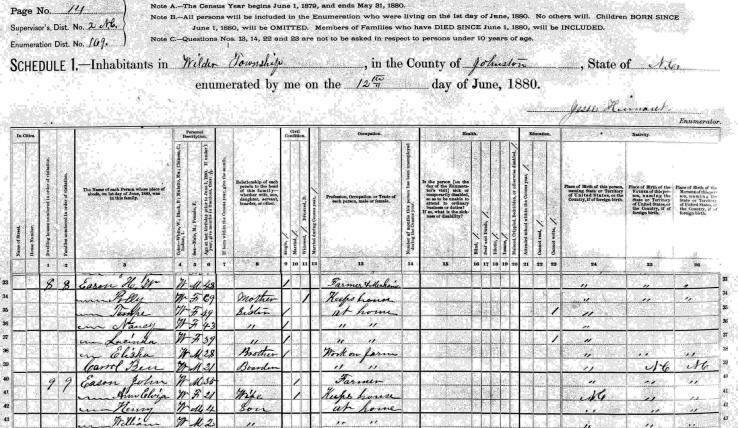 The 1870 Census finds many of their children living on the family farm in Wilders Township in Johnston County, NC. Hardy (listed as Harrie), as the eldest son, had assumed headship of the family. Eight of Hardy's siblings were also listed on the Census: Tempy (age 39), Nancy (age 32), Polly Anna (age 30), Lucinda (age 27), John (age 24), William (age 21) and Elisha (age 17). There were two other boys living with the Eason family: Willis Green (age 13) and Haywood Green (age 11). Hardy had assumed the trade of Blacksmith. Only the four youngest boys in the Eason family could read and write. 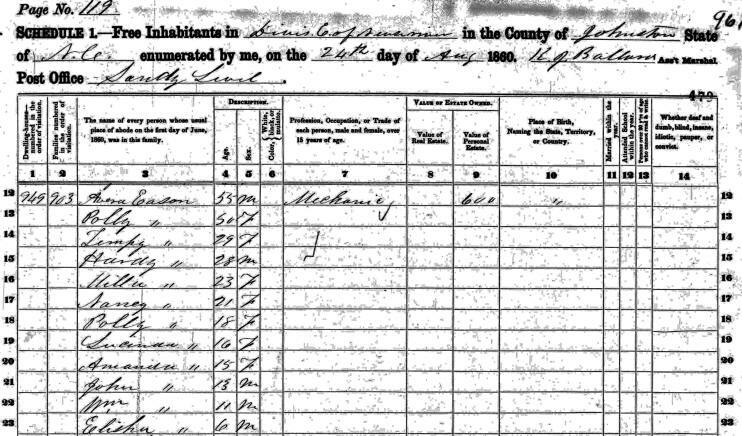 The 1880 Census shows mother Polly Eason once again living with five of her unmarried children. Hardy (age 48) is still the head of the family unit. Other siblings in the home are Tempe (age 49), Nancy (age 43), Lucinda (age 39) and Elisha (age 28). Hardy was working as both a farmer and mechanic. There is a difference from the 1870 Census concerning who in the family that could not read or write. The 1880 Census shows that only Tempe and Lucinda could not write - implying that all the others could both read and write. The family also had a boarder, Ben Carrol (age 21), who worked on the family farm. John Wesley Eason had married Annie Liza Liles and was living next door to his mother and elder siblings. 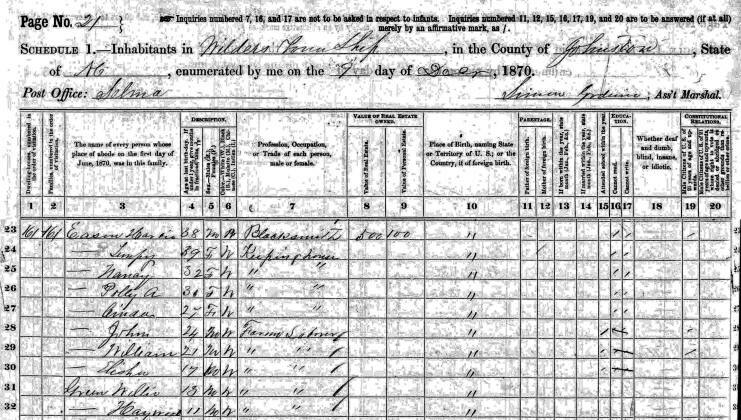 They had two sons listed on the Census James Henry (age 4) and William Avery (age 2). The 1900 Census finds Hardy, Tempy, Polly Anna and Lucinda still single and still living in the Wilders Township of Johnston County, NC. Hardy was 68, Tempe 69, Polly Anna 59 and Lucinda 58 years old. John Wesley Eason's family was living nearby, but John Wesley had died in 1897 and Annie Liza (age 42) was raising 9 kids. The children listed on the Census were Henry (age 24), William (age 22), Euretha (age 19), Bryant (age 17), Annie (age 14), Millard (age 11), Cora (age 8), Molissa (age 5) and Johnnie (age 3). Johnnie* was incorrectly listed as "Male" and as a "Son" - and should have been "Female" and a "Daughter". If you have additional information on Avera Eason please contact me.